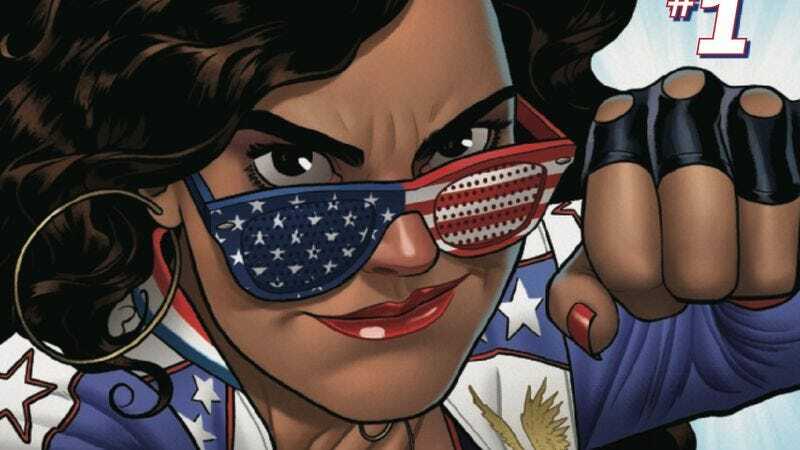 Fans of America Chavez have been clamoring for the character to get her own ongoing series for years, and it’s finally happening next week with the release of America #1, one of the year’s most anticipated superhero comic debuts. America is the comics debut of YA novelist Gabby Rivera, who made a big splash with her 2016 book Juliet Takes A Breath, which follows a young Puerto Rican lesbian over the course of a summer of self-discovery. Marvel made a wise decision in hiring a queer Latina to write a series about a queer Latina character, and Rivera is working with an art team of exceptional veterans to help her make a smooth transition into the world of superhero comics: penciller Joe Quinones, the father-son inking duo of Joe and Paolo Rivera, and colorist José Villarrubia. This exclusive preview of America #1 begins by exploring who America is to various characters in the Marvel Universe, both superpowered and not (with a cameo from Gabby Rivera in the bottom left panel of the first page). From the very start, the script is forming a deep connection between the main character and the country she’s named after, and Rivera is making a strong statement by associating America Chavez with the future and hope in a turbulent political climate that is trying to diminish the value of queer and Latinx people. From there, the story switches gears into spectacular superhero mode, showing America and her Ultimates teammates fighting an alien in the America’s home dimension, summoning memories of the heroine’s mothers and her longing to be with them again. Joe Quinones’ artwork on books like Howard The Duck and FF showcased his talent for both rich character work and bombastic superhero action, and those skills are on full display in this preview. The opening page showcases his intense control of facial expressions and body language, and he brings exhilarating energy to the fight that immediately follows. Joe and Paolo Rivera’s inks add sleekness to Quinones’ pencils, and the combination of the crisp inking with José Villarrubia’s bold coloring makes for some especially striking visuals. America is in great hands with this creative team, and it will be exciting to see how her story evolves now that she’s finally flying solo.